So speaks the aging Ulysses to his companions in Tennyson’s great poem. Unwilling ‘to rust unburnished’ and die by his own hearth, he sets out actively to seek the lands beyond the sunset, the home of the heroic dead. Aigisthus indeed has been struck down in a death well-merited. a wooded island, and there a goddess has made her dwelling-place. from his own country, longs to die. Zeus agrees that it is indeed time to work on bringing the hero home. cliffs to the open water, but the others were all destroyed there. of the lovely hair, the dread goddess who talks with mortals. …let the blast of the North Wind carry you. go forward into the mouldering home of Hades. or a dream, and the sorrow sharpened at the heart within me. than be king over all the perished dead. For me, one of the most fascinating things about the Odyssey is the prevalence of powerful women, beside whom Odysseus is simply a homeless wanderer. There are the nymphs Calypso and Circe, the female monsters Scylla and Charybdis, the goddesses Persephone and Athene, the Sirens, the princess Nausikaa who rescues Odysseus after his second shipwreck, and her mother Queen Arete whom Nausikaa advises Odysseus to approach first rather than her father King Alkinous. There is wise Penelope, Odysseus' wife: clearly queen in her own right since marriage to her will give one of the suitors kingship. There's even Odysseus' old nurse, who is the first person to recognise him on his return to Ithaka. And there's Odysseus’ longing to embrace his beloved mother in Hades. It’s so different from the warlike world of the Iliad in which women – Chryseis, Briseis, Andromache, Helen, Cassandra – are powerless victims. No wonder Robert Graves suggested in his novel ‘Homer’s Daughter’ that the Odyssey was written by a woman! But most of all, the Odyssey sets the pattern for the Mystical Voyage, which takes the protagonist from one magical island to another, encountering mystery, danger and wonder. 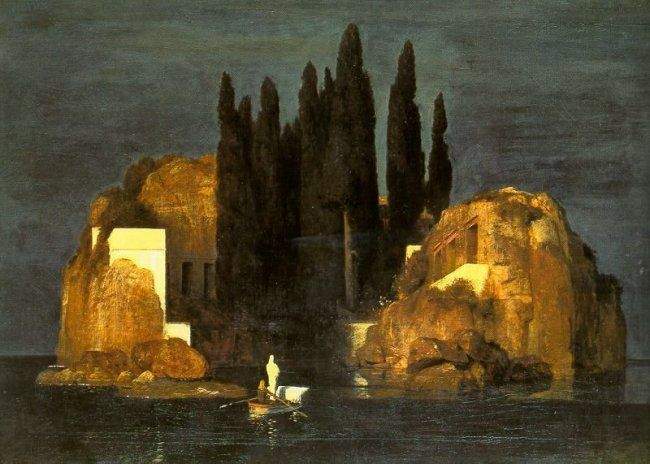 The island sealed with brazen walls, the island surrounded by whirlpools, the island of the winds, the dark shore of Death with its black poplars and whispering willows, all these will recur and echo down the centuries. He clambered across the cargo and up the curve of the ship into the stern, where he stood for a moment holding the tiller and gazing out westwards. The sun was low, laying a bright track over the water: a road studded with glittering cobblestones. It stung his heart and dazzled his eyes. He felt a surge of longing. Life was a tangle that tied him to the shore. What would it be like to cut free, shake off the land, and go gliding away into the very heart of the sun? That ships and suns go together can be seen from the Egyptian sun god Re with his two boats: the sun boat or Mandjet (Boat of Millions of Years) which carried him from east to west across the sky accompanied by various other deities and personifications, and the night boat, the Mesesket, on which the god travelled through the perilous underworld from west to east, to rise again in the morning. How old is Re? Well, judging by the dates of temples dedicated to his worship, his cult rose to its zenith in the 5th Dynasty, beginning approximately 2500 BCE. The dead were expected to spend eternity travelling with him across the sky. (Later his cult was superseded by the resurrection cult of Osiris.) 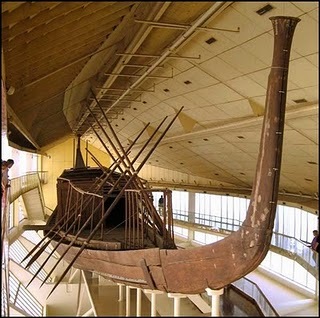 The photo above this paragraph shows the full-size Egyptian ship known as the Khufu ship, 143 feet long and built of Lebanon cedar, which was sealed into a pit at the foot of the Great Pyramid of Giza: the remains of many other solar boats have been found in different locations in Egypt. 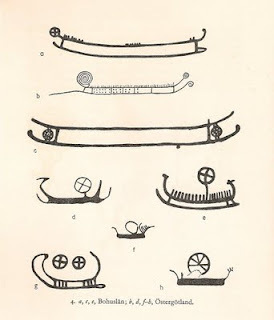 Rock engravings in Scandinavia, dated to the Bronze Age any time between 1500 and 400 BCE show the same correspondence between ships and suns. 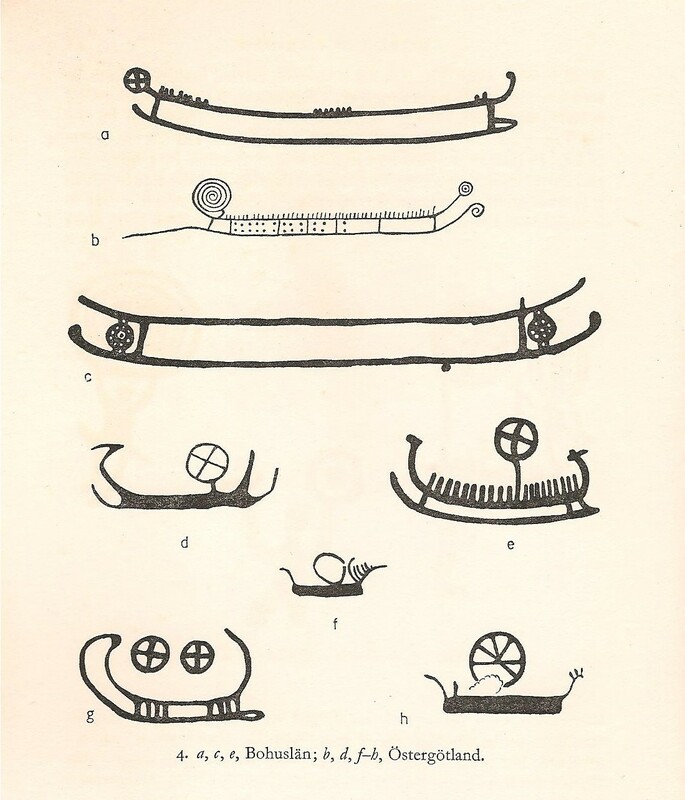 Here are some examples, reproduced in ‘The Chariot of the Sun and other Rites and Symbols of the Northern Bronze Age' by Peter Gelling and Hilda Ellis Davidson, showing ships embellished with sun discs and spirals. But people have been heading out to sea for literally hundreds of thousands of years. Here’s a link to an article which seems to show that even before we were modern humans, hominids such as homo erectus ‘used rafts or other seagoing vessels to cross from Northern Africa to Europe’ – island-hopping as they went and leaving stone hand axes on Crete dating to at least 130,000 BCE. How amazing – how utterly mind-blowing is that? Modern humans crossed to Australia 60,000 years ago, and to North America earlier than 13,000 BCE. Whatever drove them to make these discoveries? A nomadic hunter-gathering lifestyle is one thing: but setting off in a boat or on a raft on a one-way trip into an unknown ocean is quite another, especially with no population pressure pushing you on. I can’t help but wonder if there was there a religious, a mystical element to these early voyages of discovery. Maybe, standing on the sea shore, gazing at the sun rising or setting (depending which side of which continent they were), early peoples believed themselves to be embarking on journeys to follow the sun to the land of gods and the happy dead? Nor heroes under heaven, / who received that cargo. Who received that cargo? By the time the Beowulf poem was written down, England was Christian. But the poem leaves us in doubt as to the eventual supernatural landfall of a pagan king: it was an age which could still hold Christian and pagan beliefs in relatively comfortable simultaneity – an age which, maybe, knew it didn’t have all the answers. And people down the centuries have been buried in ships, like the Anglo-Saxon Sutton Hoo ship, dating from the early 7th century AD, and the Oseberg ship, circa 800 AD, which carried the bodies of two women, priestesses or queens, and the Gokstad ship, built of oak felled around 890 AD, sheltering the body of a man, perhaps a king. The 10th century Muslim traveller Ibn Fadlan wrote an eyewitness account of a Viking ship-funeral in Russia: a chieftain interred in his ship along with many grave goods and sacrifices, including that of a slave girl who ‘saw’ into the land of the dead in a kind of drugged trance, after which she was strangled and stabbed and laid beside him to accompany him on his mystical voyage. According to Ibn Fadlan’s account, she had voluntarily offered herself as the sacrifice, and we needn’t be too sceptical. In all probability she utterly believed she would be accompanying her lord to the Otherworld. He was her passport to immortality. So ships and suns and voyages into the west have been part of the human imagination for many thousands of years. After Re the sun god, there came Odysseus, Jason, Maelduine, Brendan, Oisin and many a nameless adventurer with them. There came the Christian hermits who sailed out to remote islets in the Atlantic, and the saints who founded monasteries on Holy Islands like Iona and Lindisfarne. And for the next few weeks, I’m off to explore some of these tales of mystical voyages. So let’s set sail for the western isles, the land of the gods, the land of the dead, the land of the ever-young. Bid farewell to Middle-Earth. This way to Aeaea, Avalon, Tir na n’Og, Valinor, Eldamar, the Hesperides and Hy Brasil. Hush! Can you hear the seagulls crying? The table of contents for the forthcoming Datlow and Windling YA dystopian anthology, 'AFTER' which will be published in the United States by Hyperion in 2012. I'm so, so thrilled to be included in this company - just look at them! I can hardly wait to read the other stories. Gillian Philip’s first YA fantasy, ‘Firebrand’, was one of the best books I read last year. 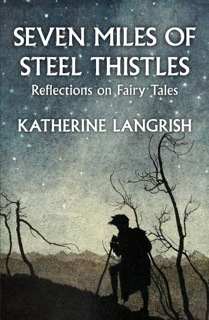 I talked about it in my introduction to Gillian's Fairytale Reflection on Tam Lin. Set in the 16th century at a time of witch hunts and burnings, it followed the fortunes of Seth MacGregor, feral prince of the Sithe, the Scots faeries, charismatic and difficult. The Sithe are ruled by a cruel and devious queen, Kate NicNiven. There’s a protecting Veil between the land of the Sithe and the mortal world, and Kate wants to tear it away. To do so, she invokes the help of some hauntingly unpleasant creatures called the Lammyr – stretching the loyalty of Seth and his beloved brother Conan almost to breaking point. 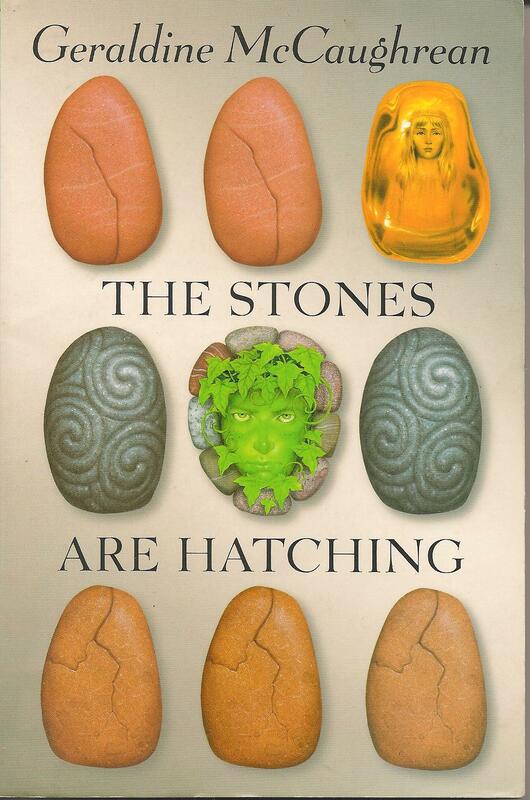 The book is dramatic, beautifully written, and rooted in the folk and faerie lore of Scotland. 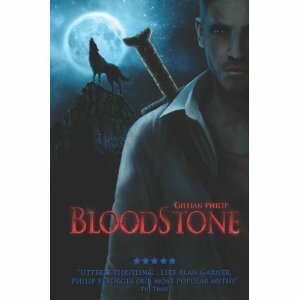 “Bloodstone” is a complex, dramatic and rewarding book – always vivid and fast-moving, but with a lot going on. Rather like her hero Seth, Gillian Philip expects readers to keep up. If your attention does stray, it’s possible to get a little lost, but hey – it’s nice not to be treated like an imbecile. It's also very nice to read a book about faeries in which the plot is not focussed on a romance between impossibly gorgeous doomed teenage lovers. 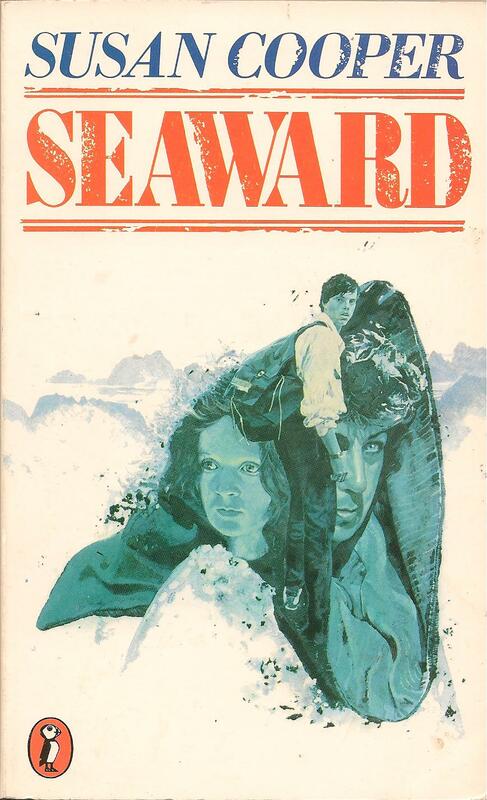 The black-bellied waves were fringed with phosphorescence, and against their light was a figure: too tall, too lanky to be Leonora, hunched into a long coat with an upturned collar. The coat that was no coat moved and glistened like a wet pelt. The creature wearing it turned, and I sucked in a cold salty breath. Ride down to Hell on his milk-white steed. Every now and then you come across a book that’s just different. It might be a one-off by an author who puts everything she or he has to say into a single creative burst – or it may be something that stands out from a writer’s other work like a black swan in a white flock. Especially in the latter case, such books often don’t get the attention they deserve. Perhaps they simply puzzle the author’s faithful followers. They can’t be categorized. They come out of nowhere and don’t seem to lead anywhere. The easiest thing to do is – not to talk about them. But they tend to be memorable. Here are three examples, all fantasies, all written by highly talented and in some cases famous children’s writers – and none of them, I suggest, as well known as they deserve to be. I heard a cow lowing, lowing low on the lea – a mournful sound, full of calling. It called me as I stood there at the window listening in the warm twilight of October. But the enchantment is already working. As her husband falls asleep, Nora steals out into the night, leaving her four day old son wailing in the cradle, down through the wet fields to the shore. You must come with me! In a kingdom low by the sea. 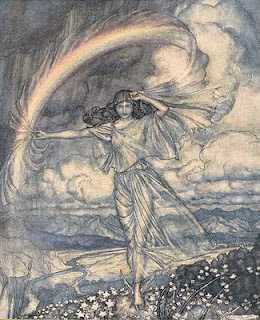 Full, full of enchantment, this tale – told by various voices – follows the path of Nora, trapped in the Erl Queen’s kingdom, her husband Eben who believes she has drowned, her son Owen, raised by the only woman his father can find to feed him – the witch Bab Magga, and Eelie, the Erl-Prince himself. 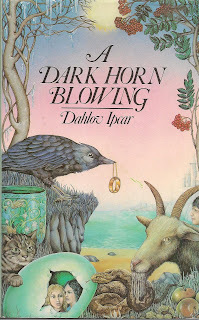 Dahlov Ipcar the author, who was born in 1917, is an artist who has written and illustrated many other books for children. She currently lives in Maine and is still painting. You can see examples of her work at her website here. 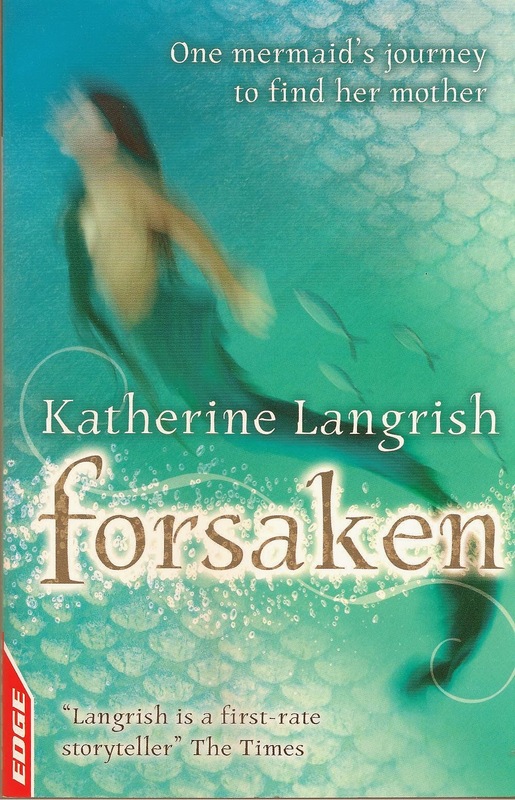 I don’t believe her other three YA novels are in print, but I would love to read them. Though Susan Cooper is best known for ‘The Dark Is Rising’ sequence of YA novels, in my opinion ‘Seaward’ outshines them all. It’s simply one of the strangest, most haunting fantasies I’ve ever read. After his mother is killed, a boy called Westerly goes travelling seawards through a mysterious world to find his father - while Cally is a girl whose parents, one after the other, have left her, heading west to the sea themselves in a car driven by a mysterious woman with silver hair. And then Cally begins to hear singing in the empty house… ‘rhythmic waves of melody repeated again and again.’ The voice sounds like her mother’s, but no one else can hear it. Cally washed, pulled on a shirt and some jeans, went back into her parents’ room – and then all at once the singing was back… changed… to a pattern of hammer-blows, beating at her ears. Cally wheeled about, her hands up in defence, terrified. All round the house, out at the edge of the trees, the massive stone figures had been standing in a silent ominous line. Now the sun was going down, and the shadow of the trees had overtaken them – and where they had stood was a long unbroken barrier of rock. Finally, at the sea, under the eternal sweeping beam of a lighthouse, Cally and Westerly come to their journey’s end. It's a moving and wonderful exploration of life, death and grief. 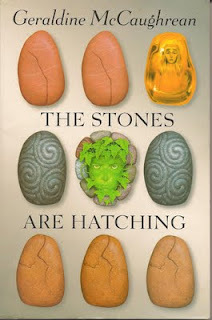 Third on my list is Geraldine McCaughrean’s The Stones Are Hatching (Oxford 1999). McCaughrean is one of Britain’s most original YA writers: she never repeats herself; but I still think this book stands out from the rest of her work. It’s just… peculiar… in the most inventive and satisfying way. 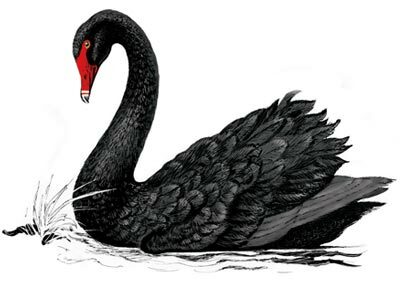 Perhaps there are echoes of Alan Garner – or even more, of William Mayne – but it’s another black swan, all right. Set in rural England during World War I, while the guns thump and crump just across the Channel in France, young Phelim wakes up one morning to discover that his world is turning upside down. The stove has been pushed against the door - ‘the whole massive, five-door, cast-iron range’ – the kitchen is full of glashans: ‘stark naked men and women about as tall as his waist, shaggy and matted with filth’ – there’s a Black Dog outside, ravening and raging, and the domovoy or house spirit he never knew existed shoves him outside with the information that he – Phelim – is the Jack o’Green who must defeat the Stoor Worm. Phelim swung his sickle. The wheat hissed, the bearded ears fell against his face making him close his eyes. Then the curve of the blade clanged against something hollow and metallic and black. No white-clothed beauty this. At close quarters, he could see the rust-red eyes, the adze-shaped chin, the nose as curved as a bill-hook. Her long black skirt was pale with dust, but not the shiny black of her iron upper body. Her long, flue-black, iron breasts had blunted countless sickle blades as she stood amid the wheat, waiting for her victims to blunder into her. She held a long-handled scythe, but she and her sisters had not come to harvest wheat. And with Alexia the young Witch, Mad Sweeney the Fool, and the ever-cheery Obby Oss, Phelim reluctantly sets out to deal with the Worm which the guns of France are gradually awakening from its age-old sleep. What perhaps all these books have in common is an almost hallucinatory quality, a vision of the world as an unsettling, startling, ever-changing place full of unexpected grotesqueries, dangers and beauties. Do read them. They will enrich your life. Fairytale Reflections - "Happily Ever After"
Oral storytelling necessitates a framework. Anyone who’s tried singing or storytelling or in any way performing, for that’s what it is, in a crowded space, knows that you have to call for attention before you can begin. That’s why Shakespeare’s plays often begin with a prologue – a man standing on the stage to deliver a speech about the background to the drama, or a couple of minor characters loudly joking and quarrelling, or a shipwreck with lots of dramatic sound effects – something that won’t matter if you miss half of it, something to shut the audience up and make them settle down and pay attention. And so the room hushes, the people attend, the storyteller spins her tale. There’s a real physical element to listening to a story. It’s like going on a roller coaster. It’s not like reading, where everything happens at exactly your own pace, and you can glance ahead, or turn back to check on something, or put the whole book down for ten minutes to make a cup of coffee. Listening to a story, you are in the power of the storyteller. You must keep still and listen carefully not to miss a word. You watch her face as she frowns or smiles. The flash of her eyes, her gesturing hands. You don’t know what is coming next, or even how long the story is going to be. For she on honey-dew hath fed, and drunk the milk of paradise. Everything is a surprise. No, it’s not the end yet. It’s getting more conscious and ironic, isn’t it? Fairytales, contrary to what people suppose, are not naïve. Their very existence floats in the relationship between narrator and audience. Indeed it is naïve to imagine that ‘happy ever after’ – much derided as a banal or smug or thoughtless conclusion – was ever intended as much more than the signal that the story is over. The bite of narrative has been chewed and swallowed: the show is done. The listeners can get on with drinking beer, eating, bargaining, gossiping, telling rude jokes, or heading off outside for a piss, or trudging home to their own difficult wife, husband or parent. Beginnings are important, endings less so, because the stock phrases that signal the end of a fairytale do not call for attention, but dismiss it. They don’t place the story in the mythic past, they undermine it. ‘If they haven’t died yet, they are living there still’ (but how likely is that?). 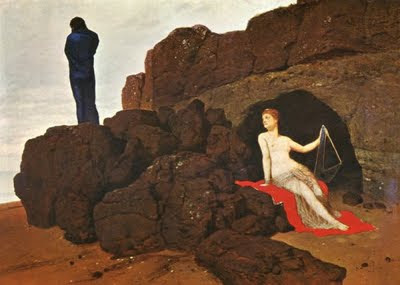 And so fairytale endings are far more varied than beginnings: in fact they can be purposely surreal and disconnected. ‘And when the wedding was over, they sent me home in little paper shoes over a causeway covered in broken glass’. Dear readers – here is the end of the Fairytale Reflections series. She may actually be Iris with her rainbow scarf. She hasn't much to do with the post, but I like her.